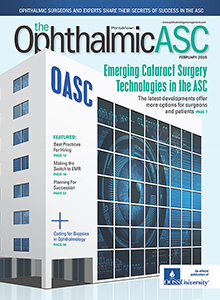 The February issue of OASC addresses how to work smarter, not harder, to convert 2018 New Year’s resolutions commonly shared by ophthalmic professionals into action. Should I expand my clinical practice or ASC? What do I need to know about private equity investment in practices and ASCs? How I do maintain quality control in my center? What about surgical flow? Resolving to improve your ASC is important. Delivering on those resolutions is absolutely essential. 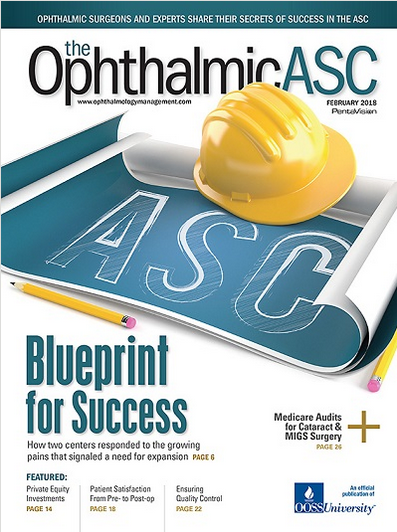 READ the digital version of Ophthalmic ASC or download a PDF for off-line reading. Look for the print issue with the February 2018 issue of Ophthalmology Management. The Ophthalmic ASC is an official publication of OOSS University, produced by PentaVision, publisher of Ophthalmology Management.